Following extensive research exercise has emerged as an effective treatment for major depressive disorder, and it is now a recognised therapy alongside other interventions. In contrast, there is a paucity of research examining the therapeutic effects of exercise for those with bipolar disorder. Given that dysfunctional reward processing is central to bipolar disorder, research suggests that exercise can perhaps be framed as a reward-related event that may have the potential to precipitate a manic episode. The behavioural activation system (BAS) is a neurobehavioural system that is associated with responding to reward and provides an appropriate framework to theoretically examine and better understand the effects of exercise treatment on bipolar disorder. This article discusses recent research findings and provides an overview of the extant literature related to the neurobiological underpinnings of BAS and exercise as they relate to bipolar disorder. This is important clinically because depending on mood state in bipolar disorder, we postulate that exercise could be either beneficial or deleterious with positive or negative effects on the illness. Clearly, this complicates the evaluation of exercise as a potential treatment in terms of identifying its optimal characteristics in this population. Behavioural activation is a commonly used psychological treatment for major depressive disorder (MDD) that broadly refers to the development of activity scheduling and also targets cognitive processes that are linked to avoidance.1 Research findings suggest that for MDD behavioural activation is generally an effective therapeutic intervention,2 with some studies suggesting that it is equally as effective as cognitive therapies or a combination of cognitive and behavioural activation therapies.3 Behavioural activation is particularly relevant to depressive episodes, where individuals experience difficulty engaging in physical activity because of psychomotor retardation; feeling slowed down physically and mentally. The converse is true in mania where individuals usually experience increased energy and activity levels. This may partly explain why behavioural activation has been extensively studied in relation to MDD, but there is little research as yet, investigating its effectiveness in treating bipolar disorder. Therefore, in this article, we consider the emerging research findings examining the therapeutic effectiveness of exercise as a behavioural activation strategy for those with bipolar disorder. Furthermore, we propose the use of a neurobehavioural model for understanding the effects of this treatment strategy on depressive and manic mood states. Pertinent literature was identified using Google Scholar and PubMed, with relevant search terms—such as ‘bipolar disorder’, ‘exercise’ and acceptable variations of these (update: June 2016). Given the paucity of the literature, the reference lists of all identified papers were then inspected for further potential resources with particular attention paid to more recent research findings. Depression is associated with many physical health risks, including heightened risk for cardiovascular disease and type II diabetes. Behavioural activation involves scheduling activities that are in line with patients' values; therefore, there is a distinction between physical activity or exercise in general and exercise as a component of behavioural activation. Depending on the severity of illness exercise per se is a recommended therapy for MDD,4 either as an adjunctive treatment5 ,6 or in some mild-to-moderate cases as a first-line treatment option or a second-line treatment option.5 Studies examining the therapeutic benefits of exercise in depressed patients suggest many benefits such as improved physical health, lower depressive symptoms and better psychological well-being.7 Results from a recent Cochrane review, defining exercise as ‘planned, structured and repetitive bodily movement done to improve or maintain one or more components of physical fitness’, indicate a moderate association (reported effect size of −0.62 when comparing exercise with no treatment or control intervention) between exercise and reduced depressive symptoms in adults diagnosed with depression. However, studies examining the long-term effects or high-quality trials have demonstrated only small associations and non-significant associations, respectively.8 More recently, studies have investigated the most effective type and dose of exercise in treating depression. The findings from a systematic review suggest that physical activity should be individually tailored, last a minimum of 30 min, ideally be conducted under supervised conditions and performed at least three times a week. However, these conclusions are somewhat constrained by the relatively few studies that met inclusion criteria (12 studies).9 Therefore, it seems the benefits of exercise within the context of behavioural activation are beneficial to those with depressive symptoms, however the optimal parameters of this treatment (eg, frequency, duration, type of exercise) are yet to be determined. A recent systematic review highlights that there is a lack of research examining neural activity and brain structure in relation to exercise and major depression with only three eligible studies examining this hypothesis and no studies examining the acute effects of exercise on neural activity.24 For example, Krogh et al25 found no changes in hippocampal volume associated with exercise, although there were no significant effects of exercise on depressive symptoms observed in this study. Instead, the review findings suggest that acute exercise increases atrial natriuretic peptide, brain natriuretic peptide, copepetin and growth hormone in those with MDD, all of which are physiological factors implicated in managing the neuroendocrine system. Research studies investigating healthy individuals indicate that exercise is associated with increases in brain-derived neurotrophic factor (BDNF), the expression of which supports neurogenesis.26 Therefore, the authors propose that exercise may be beneficial for those with bipolar disorder by producing higher levels of BDNF and neurogenesis, which in turn influences allostasis (the process whereby neuromodulators are released as a response to a stressful event) by reducing allostatic load; in other words enhancing the ability to cope with stress. However, findings from the systematic review conducted by Schuch et al24 did not find any support for this proposal in samples with MDD. But it is important to note that the patients in the reviewed studies were all prescribed adjunctive antidepressant treatment, and this may have confounded results. In terms of bipolar disorder, there has been some research suggesting that exercise may influence executive functioning in these samples. For example, a recent study examining the effects of acute exercise on adolescents completing a measure of executive functioning (go/no-go task) has shown that acute aerobic exercise is able to influence deficits in deactivating attention and activating inhibition.27 This line of inquiry is important to understand the potential therapeutic efficacy of exercise for bipolar disorder. Taken together these findings suggest that the BAS is not the only dysfunctional biological circuit in bipolar disorder. While a BAS framework accounts for the positive effects of exercise on anhedonia and the negative effects of exercise on hypo/mania, it does not adequately explain the potential positive effects of exercise on hypo/mania. Some patients report that exercise during mania is helpful to expend excess energy and restore a sense of structure or ‘inherent rhythm’ to otherwise dysregulated internal states.14 Although based on qualitative self-report, these findings are important and suggest that exercise may also affect important biological regulatory mechanisms that are dysfunctional in bipolar disorder (see figure 1). 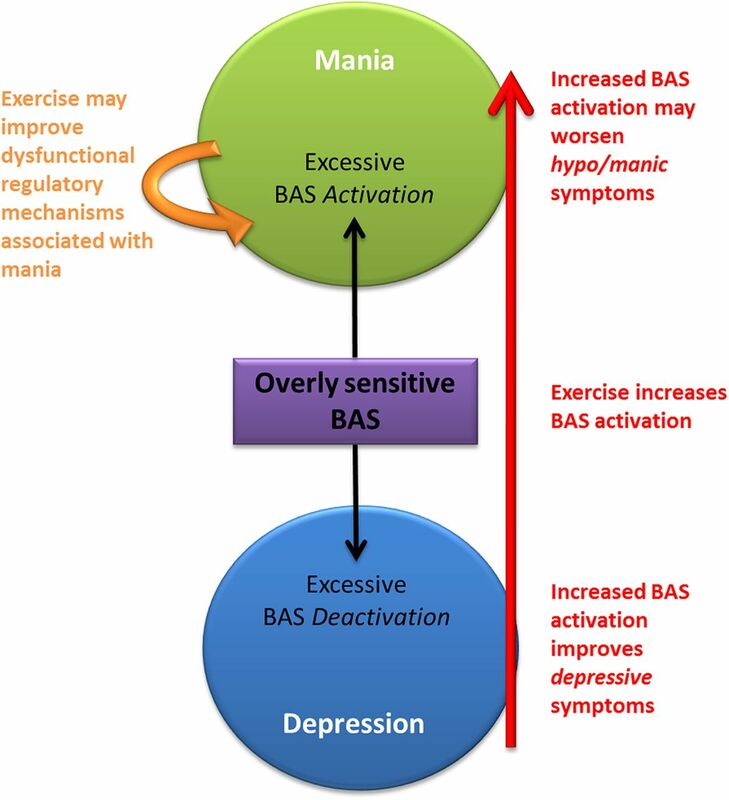 The potential effects of exercise on the BAS in bipolar disorder. The BAS is thought to be overly sensitive in bipolar disorder. Thus, events related to gaining reward, for example, exercise, are thought to increase BAS activation (red arrow). In the context of a depressive episode (blue circle), increased BAS activation is likely to improve depressive symptoms such as anhedonia. However, in the context of a manic episode (green circle), increases in BAS activation could worsen hypo/manic symptoms. The orange arrow represents the potential positive effects of exercise on hypo/manic symptoms that perhaps occur by entraining asynchronous systems and re-establishing control over dysfunctional biological mechanisms. BAS, behavioural activation system. Given the lack of research investigating the therapeutic effects of exercise on those with bipolar disorder, it remains difficult to evaluate its efficacy and optimal translation into clinical implementation. From existing findings, it appears that those with bipolar disorder have a hypersensitive BAS, and neurobiological findings suggest that reward processing in particular is impaired in bipolar disorder. Collectively, these findings suggest that exercise may have positive and negative effects that are dependent on current mood state. It would be useful for future investigations to examine the effects of exercise on hypo/manic, depressed and euthymic individuals, varying its parameters (such as the type, duration and frequency of exercise). A particularly interesting question is whether these factors differentially impact bipolar individuals depending on their current mood state? It is clear that exercise is of benefit to those with depression and may be of benefit in certain circumstances to those with hypo(mania). Disentangling the specific effects of exercise on mood state is a critical first step in understanding whether non-pharmacological interventions, such as exercise, will be beneficial for treating bipolar disorder.
. Depression in context: strategies for guided action. New York: WW Norton; 2001:224.
. A component analysis of cognitive–behavioral treatment for depression. J Consult Clin Psychol 1996;64:295–304.
. Exercise and severe major depression: effect on symptom severity and quality of life at discharge in an inpatient cohort. J Psychiatr Res 2015;61:25–32.
. Treating major depression with physical activity: a systematic overview with recommendations. Cogn Behav Ther 2015;44:341–52.
. Triggers of mania and depression in young adults with bipolar disorder. J Affect Disord 2012;143:196–202.
. The psychophysiological basis of introversion-extraversion: a modification of Eysenck's theory. In: Nebylitsyn V, Gray J, eds. The biological basis of individual behavior. New York: Academic, 1972:182–205.
. A brief review of exercise, bipolar disorder, and mechanistic pathways. Front Psychol 2015;6:1–10.
. High Behavioral Approach System (BAS) sensitivity, reward responsiveness, and goal-striving predict first onset of bipolar spectrum disorders: a prospective behavioral high-risk design. J Abnorm Psychol 2012;121:339–51.
. Reward processing dysfunction in major depression, bipolar disorder and schizophrenia. Curr Opin Psychiatry 2015;28:7–12.
. Neurobiological effects of exercise on major depressive disorder: a systematic review. Neurosci Biobehav Rev 2016;61:1–11.
. The effect of exercise on hippocampal volume and neurotrophines in patients with major depression—a randomized clinical trial. J Affect Disord 2014;165:24–30.